eCommerce shipping is the process of managing inventory, picking ordered products accurately, checking and packing orders carefully, labeling shipments, and coordinating parcel pickups and drop-offs to carriers. Having well-defined shipping and handling practices help busy e-commerce sellers handle these daily tasks efficiently and cost-effectively. Even with well-defined ecommerce shipping and handling practices, you’ll find these tasks take up much of your day as you grow. Ultimately, outsourcing these functions can be a more efficient and economical solution. When that happens, give ShipBob a call. It specializes in order fulfillment for small and growing e-commerce businesses and can handle the day-to-day work so you’re free to focus on growth. Click here to get a free quote. This guide walks you through the six essential steps of ecommerce shipping and handling that are shown above. We’ll show you how to set up standard operating procedures (SOP) at every stage plus give you a printable ecommerce shipping checklist to help you get started right. Efficient inventory storage – Your entire ecommerce shipping and handling process falls apart if you can’t quickly locate ordered items in your warehouse. A sound inventory management system and the handling procedures we cover below will ensure that you know what you have and where it is at all times. Room to pull products and pack orders – Setting aside sufficient space to stage, check, and pack orders prevents costly packing and shipping errors and keeps your customers happy. Defined shipping and receiving areas – If your space allows, separating the shipments coming in from those going out makes inventory receiving and order shipping organized and error-free. How you set this up depends on your space, the items you sell, and how often you need to pack and ship orders. Find ways to maximize the space you have and see a sample e-commerce warehouse blueprint in our warehouse layout guide. Once you have your space set up, you can tailor the SOPs we explore below to match your specific operation. Sound inventory management procedures are a key feature of any ecommerce shipping and handling best practices plan. Simply put, without a good handle on your inventory, everything falls apart and costs you money eventually. Below, we’ll examine three sets of procedures that can help you manage inventory efficiently as it comes into and moves throughout your warehouse. A good inventory management system like Lightspeed POS lets you make the most of the procedures we cover below. With it, you can create purchase orders, record received goods instantly, track items by size and color, and make adjustments as needed plus tie stock numbers to every sale you make. Lightspeed POS does all of this and much more for a low monthly fee. Try it free for 14 days to see how it helps improve your operation. Set up warehouse storage areas with clearly labeled storage and/or pick locations, such as labeled shelves, bins, or sectioned or whole pallets. If applicable, designate overstock storage areas and cross-reference these spots to your pick locations for quick access when pick locations run low. Shelf, bin, and pallet labels should include product SKU, product name, any variations (like color and size), and barcode if using scanners. If using an inventory management system, enter the warehouse location (aisle, shelf, or bin) of each product to print stock locations on pick lists and inventory count sheets. If using internal barcode labels on all products, upon receipt, affix barcode stickers to goods before moving stock to storage or pick locations. Always store received stock in its prescribed location. If the prescribed space is full, store overstock in prescribed overstock locations. If storing overstock in a new location, be sure to note the alternate location on or near the main location label and report this up the management chain, if needed. For a new product, ensure that the storage location is noted or entered into the inventory management system before products are shelved or stored. Receiving inventory properly makes your entire operation run smoothly. The receiving process is pretty straightforward: receive shipments, count items, and update quantities in your inventory management system. But, there are two things that can derail your efforts: vendor shipping errors and sloppy counting of received items. Both create stock discrepancies that lead to unexplained inventory shortages, unshippable orders, and angry customers. To avoid these costly headaches, follow the inventory receiving best practices detailed below. Upon delivery, count all received boxes, pallets, or shipped units and note any discrepancies in the number of units expected and number delivered. 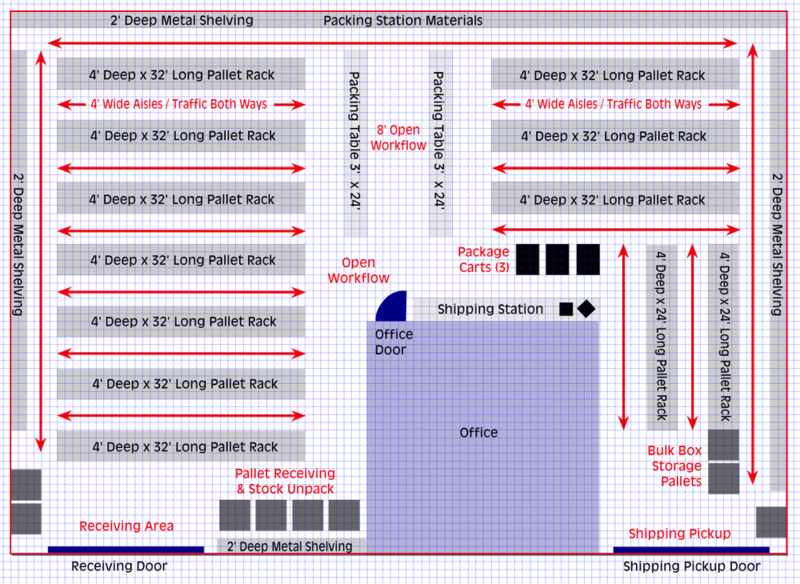 Store received shipments together in a designated receiving area until time to unpack. Unpack units, if needed, and organize items by type. Count received items against your purchase order — not the vendor packing slip. If received items match your purchase order, update the received item counts in your inventory tracking system. If there are discrepancies, contact vendor to resolve and update or adjust counts accordingly in your inventory tracking system. Stock received items per your usual product shelving or storage procedures. Annual counts are system-wide and require some prep work and usually require a sales shutdown period to handle efficiently. Cycle counts are periodic counts of a line, category, or section that can be fit into weekly workflows. Learn more about each and get count templates in our inventory management guide. Cycle counts are what keep inventory-based e-commerce companies on track, so you should build these into your usual procedures. These periodic counts help you spot receiving, storage, and picking mistakes before they become major problems. Plus they keep your stock areas organized and counts up to date, making annual counts a breeze. Here’s how you can fit cycle counts into your usual procedures. Choose a portion of inventory to count by product line, category, or storage location. Print inventory count sheets from your inventory management system or create your own using our inventory count templates. Identify a time for two staff members to count the selected stock without interruption. Have one staff member count stock, including any overstock, and the other note the counts on the inventory sheet. Once complete, confirm that numbers match on-hand numbers. If counts don’t match inventory records, follow up to spot and resolve any receiving, storage, or picking errors. Cost-effective inventory management is something that order fulfillment companies specialize in. If managing a facility and process takes you away from important business-building tasks, try using our recommended fulfillment company, ShipBob. It has low startup costs and gives you access to its web-based software that integrates with top sales channels for seamless order fulfillment. The software also comes with inventory management tools that lets you monitor, order, and manage your inventory — all from one convenient dashboard . Click here to get a free quote. Which one is best for you depends on the technology you use, your volume, and even the range of products you sell. Whatever picking procedure you use, accurate picks with thorough quality checks are essential to prevent order mistakes, costly corrections, and customer service headaches. Here’s a look at each pick method with SOPs that you can tailor to your operations. If you sell just a few different items, you can pick stock for orders in large batches easily, then simply sort them into individual orders during the packing stage. A pick list that aggregates product picks for a number of orders is the tool you’ll use with this picking method. Print (or create) a pick list that includes the total number of items needed to fill a range of orders. Assign pick lists to pickers based on product lines or warehouse location. Have pickers pull the total quantity of each product per the pick list. Designate a space near the packing area to stage picked items for sorting. Use printed order packing lists to sort or group picked items into individual orders for final checks prior to packing. Per-order picking uses an order packing slip or invoice as the pick list. Each order is picked in its entirety and moved straight to packing without the extra sorting step that batch picking uses. Per-order picking takes pickers all throughout the warehouse to fill one order, so it’s not the most efficient way for large operations to pick. However, it can work well in smaller warehouses. Print order paperwork — packing slips or invoices. Sort order paperwork by order complexity and by warehouse location, line, or category, whatever makes the most sense in your operation. Arm pickers with a series of orders and crates, bins, or boxes to sort ordered items into as they pick. For large warehouses, rolling carts or trolleys speed the process. Have pickers bring picked orders to designated staging spots near the packing area for final checks prior to packing. Scaling pick, pack, and ship operations to effectively handle sales spikes or slowdowns is one of the biggest challenges small shippers face. If staffing up and down is becoming an issue in your business, see how a fulfillment company can provide the flexibility you need. The packing stage is your last chance to make an impression on your customer and the only physical touchpoint you have so make it count. Sloppy and careless packing reflects badly on your brand, so it’s essential to design packing procedures with your customer’s unboxing experience in mind. You don’t have to create stunning customized packaging, although it’s a nice touch. However, you do need to show customers that you care by ensuring that their order is both correct and packaged adequately to protect items en route. Here’s how to do that. Final check picked orders using the best method — barcode scanners or visual checks. If products have variables like size or color, make sure those details are checked. Have staff physically mark line items with a checkmark if needed to ensure accuracy. If an error is found, move that order to a designated spot to be corrected without interrupting the checkers’ progress. Note: eCommerce shipping operations can combine the order checking phase with the packing phase that we cover next. Packers can scan and/or visually check products as the prep them for packing. Some ecommerce shipping operations ship all orders in one or just a few different boxes or mailers. Others use a wide range of boxes and fill materials. Many even have a standardized kitting and boxing procedure complete with custom packaging. Whatever your order packing method, it needs to be handled systematically to ensure the accuracy of every order. If applicable, assemble all needed shipping boxes or mailers for the grouping of orders to be packed. This step may not work if you pack a wide variety of order sizes. Move one or a group of checked orders from the staging to packing area or pack checked orders where they sit if that fits your flow. Have packing staff do a final check (visually or via barcode scan) that the items to be packed match the order paperwork. Pack items as needed using appropriate, prescribed packing materials. Insert or attach the order paperwork to the box and move it to the shipping area for labeling. (Optional) If shipping labels print out on the order paperwork, close and seal the box, affix the label, and move parcel on to the shipping area. If your shipments use just one or a few box sizes with predictable weights, your labeling procedure is fast. Your shipping software can be configured with these box size and weights so labels print in a batch or even on each order packing slip. Either way, you simply need to affix the order label to the correct packed box. Cross-check the shipping label to the order packing slip or other paperwork included in the packed box. Close and seal the parcel. Move the parcel to the designated shipping cart or pickup area. If you ship using a variety of box sizes, you’ll need to weigh and measure your box and enter this information into your shipping label printing software. Most ecommerce shipping software programs let you enter a variety of box sizes and select a box when labeling, and this is a handy shortcut. However, you probably still need to weigh each packed parcel, compare rates, and then print a label. Here’s the procedure for this type of labeling. Place the packed parcel on the shipping scale. Enter or barcode scan the order number into your shipping system to populate the label information. Select or enter the box size of the package. Enter the weight and size of the package manually, or if the scale is integrated to your system, double-check that the weight is correct. Compare shipping rates among carriers and shipping methods in your shipping software. Select the appropriate carrier and shipping method. Insert order paperwork, close and seal box (if not done previously) and affix label. Small e-commerce shippers don’t have the volume needed to get deep discounts from FedEx, UPS, and USPS. But fulfillment companies ship in volume daily and some pass their discounts on to clients. Have ShipBob run a free, quick estimate to see how much you can save. You can schedule daily or specific-day carrier pickups with UPS, FedEx, and USPS. Pickups typically occur at the same time each day, so you can plan your packing schedule to meet your pickup times. Alternately, you can drop off packages to carriers as needed. Here are ways to make both processes smooth. Sort parcels by carrier, if needed — better yet, add this step to your labeling process. Move sorted parcels to designated shipment pickup areas. Print carrier end-of-day paperwork and shipment barcode labels if your shipping system supports this (not all do). Place end-of-day paperwork with the appropriate parcel stack. Have staff meet the carrier driver and assist with package loading, if possible. This earns brownie points with your drivers in case you ever need a favor. Sort parcels by each carrier and load into bags or bins, if needed, to ease transport. Move sorted parcels to a designated area until time to load into a vehicle. Print carrier end-of-day paperwork and shipment barcode labels if your shipping system supports this as not all do. Load parcels into the vehicle, keeping stacks separate if dropping off to different carriers. Drop off parcels at the carrier facility. Have end-of-day paperwork, if using, scanned by carrier staff. eCommerce shipping and handling practices can be broken down into six basic steps that cover inventory receiving, parcel pickups, and everything in between. How you design shipping and handling practices to support your operation all depends on your unique business. The space you work within, your staffing, the products you sell, your packaging needs, your operating technology, and shipping methods all dictate which shipping and handling practices are best for you. The standard operating procedure samples we outlined above are typical of a small e-commerce operation that ships daily using a dedicated warehouse and two or three-person staff. However, the logic behind the procedures easily scales up or down and can be modified to match specific ecommerce shipping operations. Once you’ve set up your own practices, it’s a good idea to outline them in a set of SOPs like those listed above. This makes staff training easy, sets a standard of performance expectation, and helps streamline your daily flow. Do you run an e-commerce business or a multichannel operation that ships orders? What are your ecommerce shipping and handling best practices and SOPs? We’d love to hear about the best practices you use to keep orders flowing out the door. Please share your tips in the comments below.